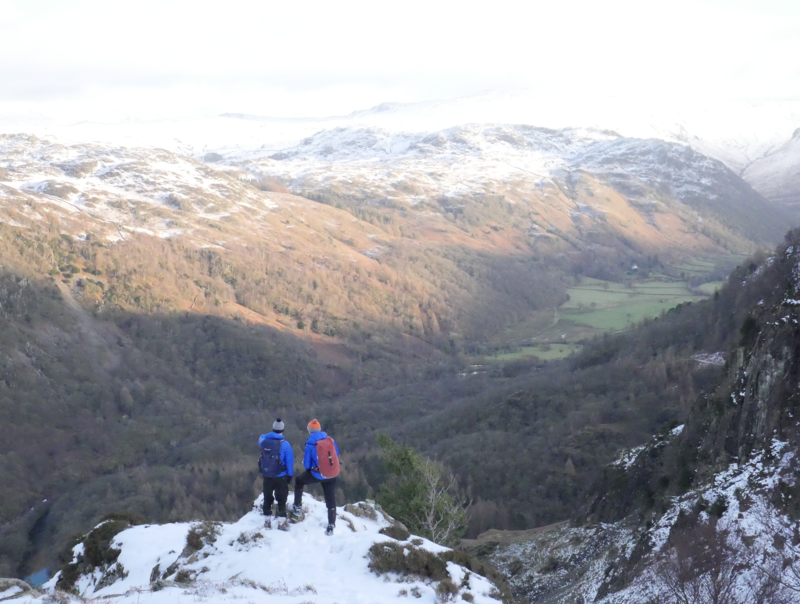 We were on our way to Keswick and had a couple of days in the mountains planned. The forecast looked good for the Saturday and undecided for the Sunday but thought we’d play it by ear – there was always something else we could do if the snow proved to be too much for us. When the morning dawned, grey and miserly the unconscious decision was made to have a more leisurely breakfast. Having met downstairs for 7.30, this didn’t cut into our day too badly and we spent an hour taking time over some lovely food before we set out for the day. I love being able to walk from the door and so we set out from Keswick YHA and headed through the town centre and on through the outskirts towards Catbells. 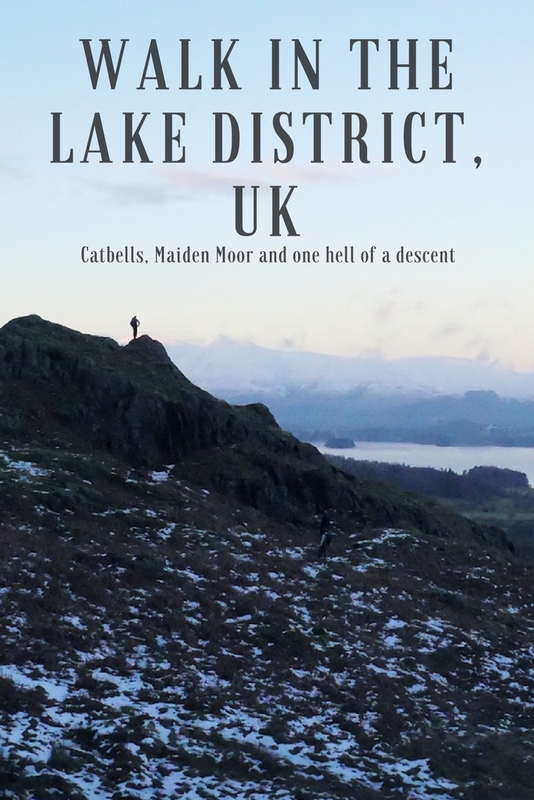 Our plan was to do a linear walk up Catbells and on to Maiden Moor. 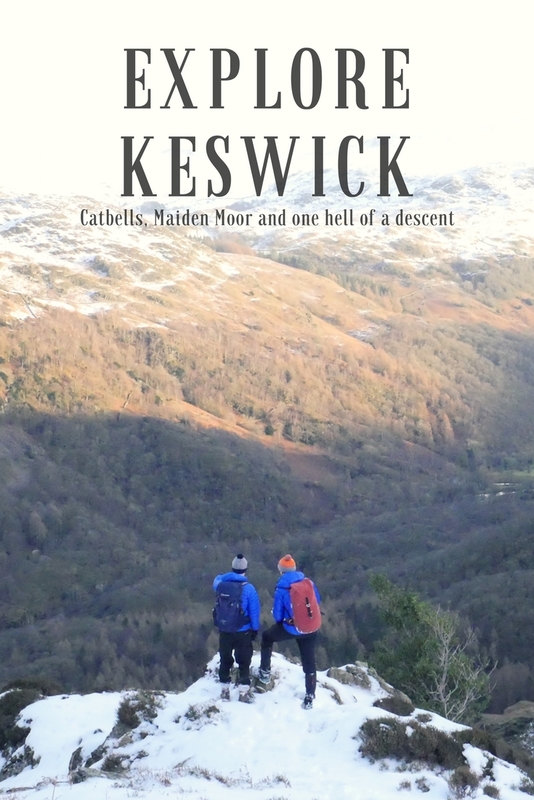 If we had time we would continue on to Dale Head but having studied the map we noticed there were many routes to cut down so we could then catch the bus back into Keswick. Don’t have time to read? Watch the video! Catbells is always busy and this day was no exception but we hoped that most people would stop at Catbells and we’d have peace as we continued up onto Maiden Moor. It wasn’t long before we hit the snowline and things started to get a little on the slippery side. 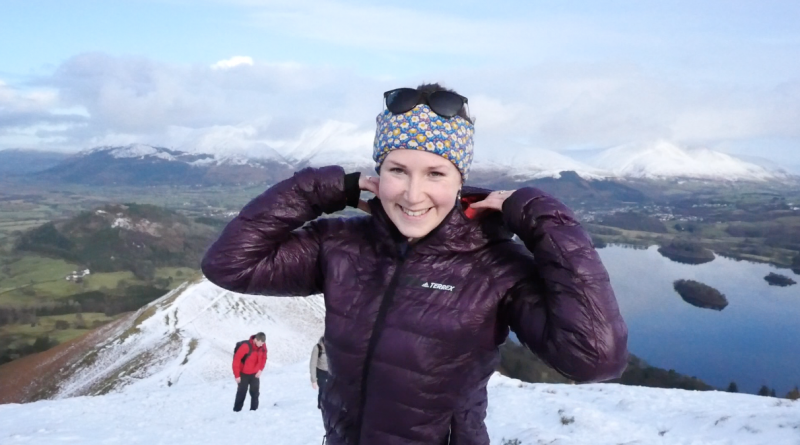 Catbells is renowned for being a lovely family friendly walk from Keswick but there are a couple of sections that do require hands to pull yourself safely up the hill. It’s a fun route, but we did end up queuing a little to get up some of these steeper sections. Making myself look up and enjoy the views down to Keswick I felt warm and happy to be up there despite the crowds of people. The views were really opening up and we could see an ethereal looking Blencathra out beyond Derwent Water and Keswick town sat at its foot. 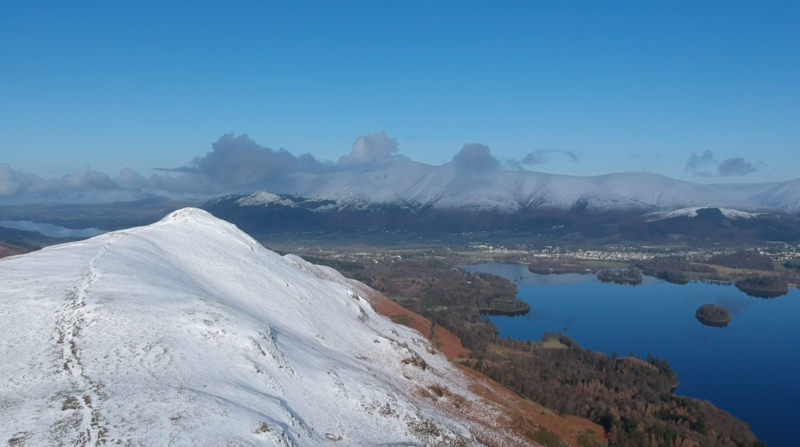 As the clouds lifted, blue skies appeared giving a snow-capped Blencathra a wonderful backdrop. 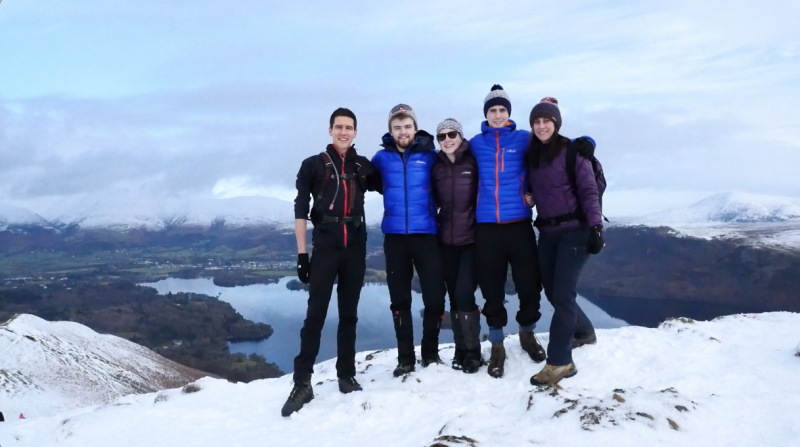 The summit was abuzz with families and friends marvelling at the views and we happily joined them. The vista before us was truly spectacular and I realised the lakes had won again, claiming a small part of me. 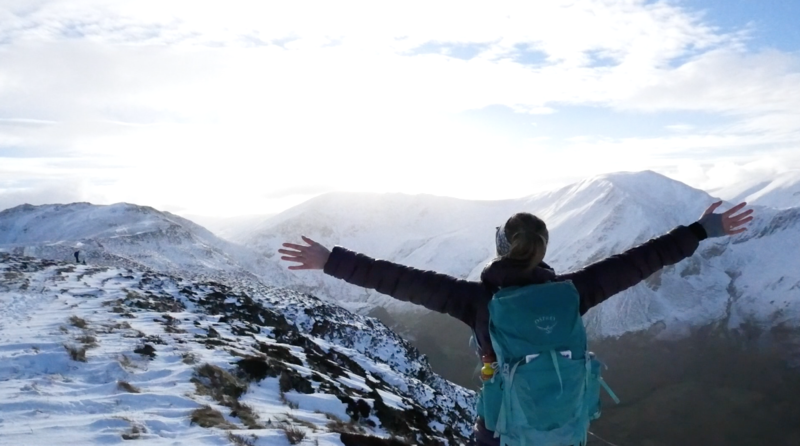 Snowdonia has forever been my favourite place and I’ve never understood the lure of the Lakes but as I stood on the summit and looked around at the mountains topped with snow I had to admit it was a sight to behold. Descending Catbells we set our sights on Maiden Moor. Catbells I’ve been up a good few times now but I’ve never walked further afield. I was looking forward to seeing what it would be like. Slopes were gentle and the climb easy – even in snow. 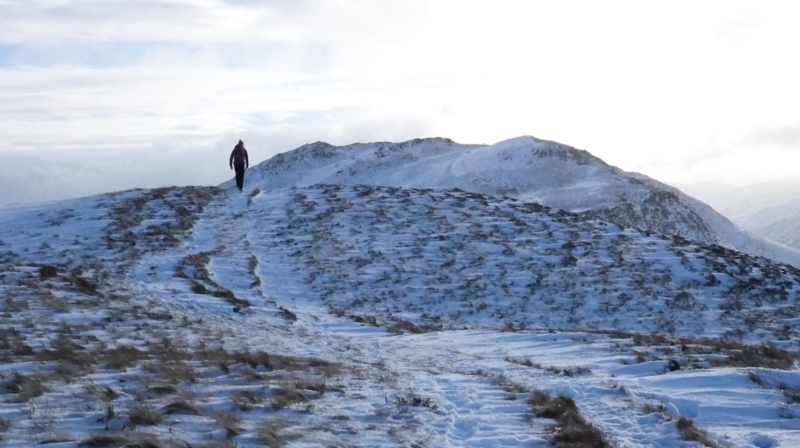 Maiden Moor I think is one of the fells that isn’t particularly distinguishable in its own right – not like Catbells is with it’s sharp pyramidal shape but the walk was enjoyable non-the-less. The winter sun was in full bloom now and as it glistened on the snow we delighted in our surroundings and the way the soft light glistened on the ground. As we came towards the summit of Maiden Moor, and the point we’d need to descend it was striking. The sun was getting lower in the sky and provided dramatic backlighting to those walking in front of me – so much so that some almost disappeared for the large flares of light that distorted their bodies as I squinted ahead. After closely examining the map we decided where the path down would be. 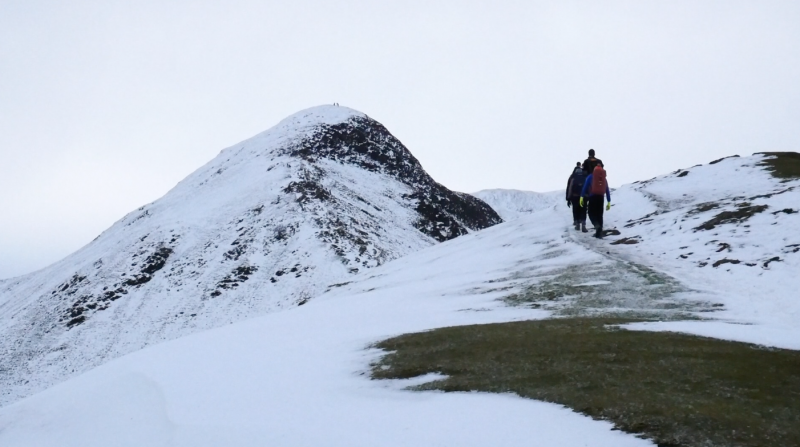 Paths are usually clear in the Lake District due to the high volume of walkers but the deep snow scuppered any chance of blindly following. Checking all the details and matching up crags to the map we started our descent – possibly the most entertaining but the sketchiest part of the walk. The snow was deep and hard to walk in, making us flounder around and be glad that we hadn’t decided to continue on as the light was fading faster than we’d like. High spirits came to an abrupt halt as we came to the second part of the descent. We’d known from the map it was going to be steep but traversing it in the snow would be a little bit of a hair-raiser. Having consulted the map once again we were sure we were on the right path, and another party had joined behind us with another assuring us this was the correct route, too. We had seen no other route down before this one, and all the surrounding features matched the map perfectly and so we started our careful descent. By the time we’d reached the bottom of the piles of stones we’d just descended the light was truly soft and getting dimmer with every passing minute but we had found the path again. Following it, we dropped down into Grange and sat down to wait for the bus with 10 minutes to spare. 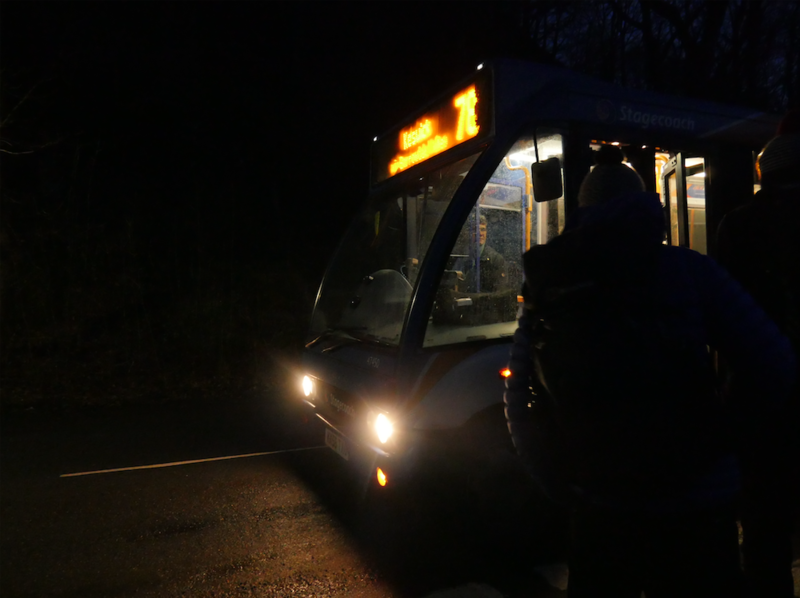 It was the last bus back into Keswick. Although we’d never thought to get the last bus, aiming for the one before it, we hadn’t anticipated how slow and careful the descent would be. 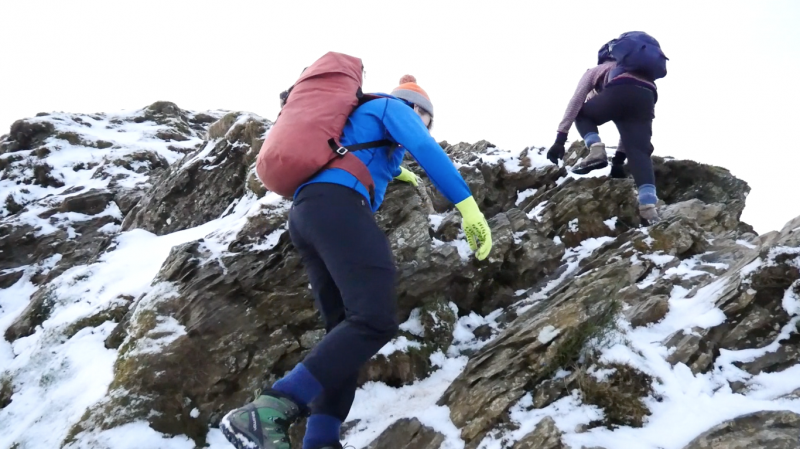 It was certainly a good lesson to remind us that best laid plans don’t always go as you’d thought – even if you’re attempting a walk that’s perceived to be simple and easy. It never hurts to have a gentle prod from the hills to be prepared. What happened to the rest of the weekend? We had to bail. Heavy snow was forecast not only in the Lakes but also in Yorkshire and the Peaks, where we would all be returning to. After our experiences on the A66 on the Friday night, and our lesson of respecting the elements on the Saturday we opted to stay on the safe side and go home to avoid driving in adverse conditions – or not even being able to get home at all. The Lakes will be there another time for us to return to. Lovely post with gorgeous pics. Have saved both pins to my bucket list board and wild camping board. Thanks for a lovely read. Thanks so much Sarah 🙂 That’s so lovely to hear! 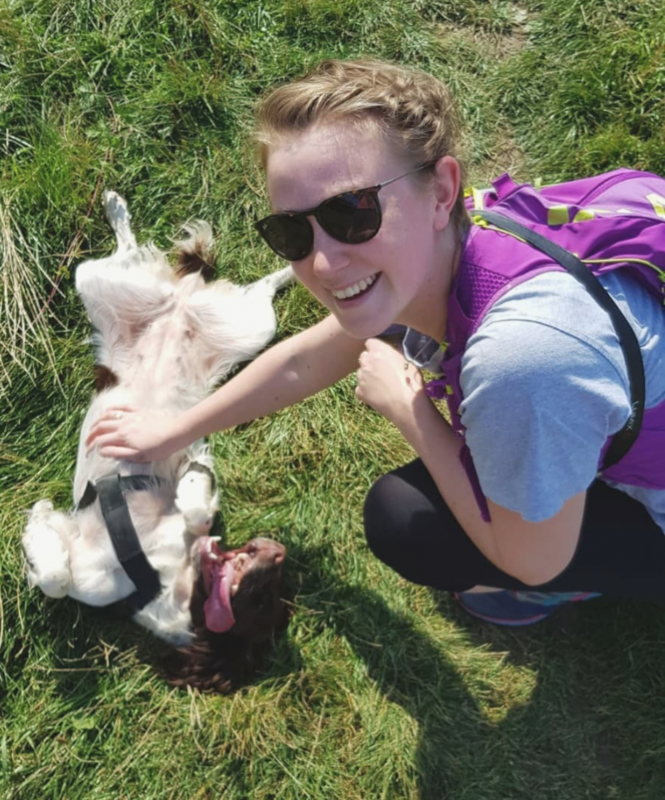 Will you be following up with blogs on your C2C challenge? Would really like to hear how it goes! Lovely post, amazing pictures and I just love the videography! I’ve subscribed to your channel immediately. It looks amazing over there!